Never leave another putt short with Speed Optimized Face Technology. 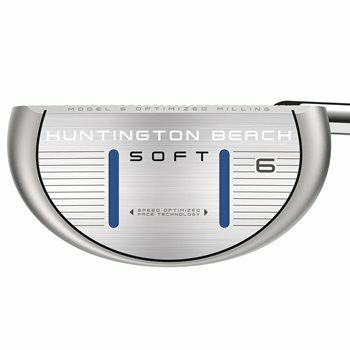 The Huntington Beach Soft offers the distance control, feel, and confidence to sink more putts. The Speed Optimized Face Technology produces consistent distance on every putt. The Diamond CNC Milling Pattern is engineered with deep grooves to provide a soft feel with a true, on-line roll. The optimized CG location offers solid feel and stability for straighter putts through strategic weight redistribution. It features 6 unique, tour-proven head shapes that suit any golfer’s stroke and style. You can also personalize your putter with multiple color options. Speed Optimized Face Technology produces consistent distance on every putt, even mishits. Diamond CNC Milling Pattern with deep grooves provides soft feel with a true roll that starts on-line. Optimized CG Location through strategic weight redistribution provides solid feel and stability for straighter putts. 6 Tour-Proven Shapes will suit any golfer's stroke and style.